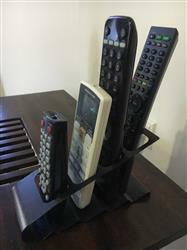 Metal organizer keeps your multiple remote controls and devices all at one place. Curved panel with staggered base allows remotes to be seen and accessed from various directions. Simple and minimalist design fits in with any home decor. Transport station easily with ball-shaped handle. Holds up to 4 remotes or mobiles phones. In the current world dominated by technology, us humans are slaves to our devices and with that, the remote controls. This Remote Control Holder is perfect for organizing your various remotes for TV, air-con, DVD player, Xbox, Playstation etc, and keeping them together and within an easy reach.